Boston’s acclaimed French restaurant from celebrated Chef/Owner Jamie Mammano. Located in the city’s stylish South End, Mistral showcases Chef Mammano’s uncomplicated French Mediterranean cuisine, highlighted with the season’s finest ingredients. Inspired by the wind that sweeps through the south of France, the restaurant’s decor is reminiscent of Provence with hand picked French pottery, high ceilings and arched floor to ceiling windows that evoke a feeling of warmth and sophistication. 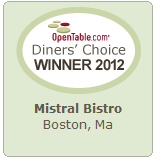 Mistral’s dramatic dining room serves dinner nightly and Sunday Brunch. In our bar and comfortable lounge area we also offer craft cocktails and fine wines to compliment Chef Mammano’s menu. Mistral’s private dining room, Le Salon du Mistral, accommodates 60 seated and up to 80 guests for a reception. Guests of Mistral are invited to use the restaurant’s complimentary car service for transportation within metro Boston and there is valet parking ($21) on-site. We are located at 223 Columbus Avenue, between Berkeley and Clarendon Streets. 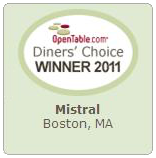 Chef Jamie Mammano began redefining the Boston restaurant scene in 1997 with the opening of Mistral, a French/Mediterranean restaurant in Boston’s South End. Chef Mammano embarked on his second restaurant venture with Mistral partner Paul Roiff in January 2003 with the opening of Teatro, a stylish yet casual Italian-influenced bistro. With Teatro, Chef Mammano created comfortable dining with an open kitchen and playful design in Boston’s Theatre District. In January 2006 the pair opened Sorellina, offering regional Italian-Mediterranean cuisine with a modern twist, a unique wine list and a warm-modern design intertwined with the glow of a back wall mural and floor-to-ceiling windows. Chef Mammano and Roiff followed this by partnering in The Federalist in November 2005. In August 2007, The Federalist transitioned into a modern steakhouse named Mooo….. Also in 2007, L’Andana opened in Burlington, MA featuring wood-grilled Tuscan cuisine. The design captures the rustic look of an old world farmhouse with end-grain wood floors, weathered barn board, steel, Italian mosaics, and chandeliers made from old wine barrels. In 2013, Mammano and Roiff opened their newest concept, Ostra, a contemporary Mediterranean seafood restaurant. Ostra provides a sophisticated and inviting dining room with an elegant bar and piano lounge, as well as an exclusive private dining space. The hotel properties of CHG include XV Beacon, a luxury boutique hotel and its sister property, The Inn at St. Botolph, offering edited services at an affordable rate. Through its doors, Fifteen Beacon Hotel offers distinguished and discreet personalized service. You will find our sleek, earth-toned décor refined, set off with works of fine art, our appointments efficient and the height of functionality. Amenities at Fifteen Beacon positively define luxury. The Inn at St. Botolph offers understated contemporary interiors graced with traditional styling and comfort. The Inn’s warm interior mixes sleek sofas, steel four-poster beds and classic wing chairs in shades of cinnamon with black and touches of blue to create an atmosphere as charming as it is inviting.